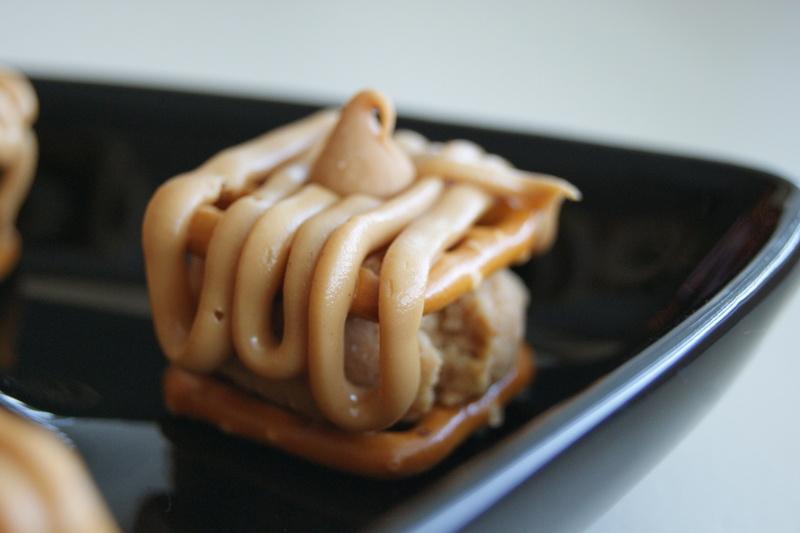 This recipe is for all my fellow peanut butter lovers out there! 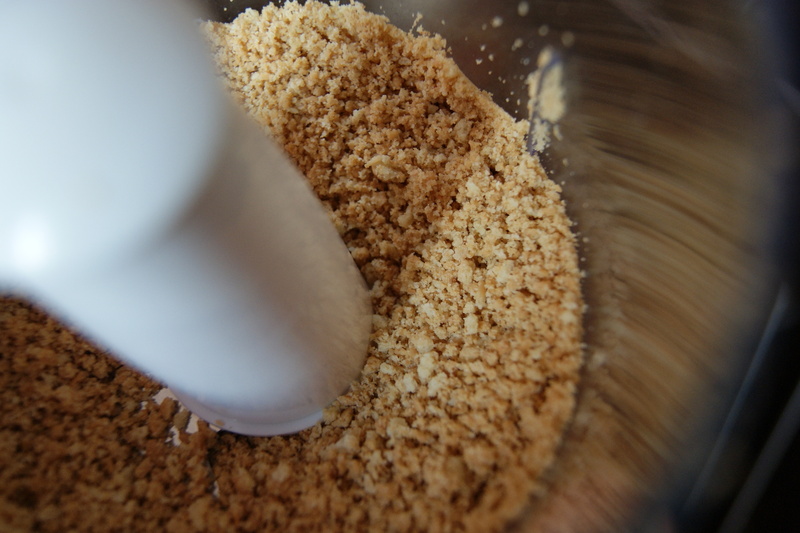 Drop all Nutter Butter cookies in large food processor and pulse until finely crumbled. Transfer to large mixing bowl. 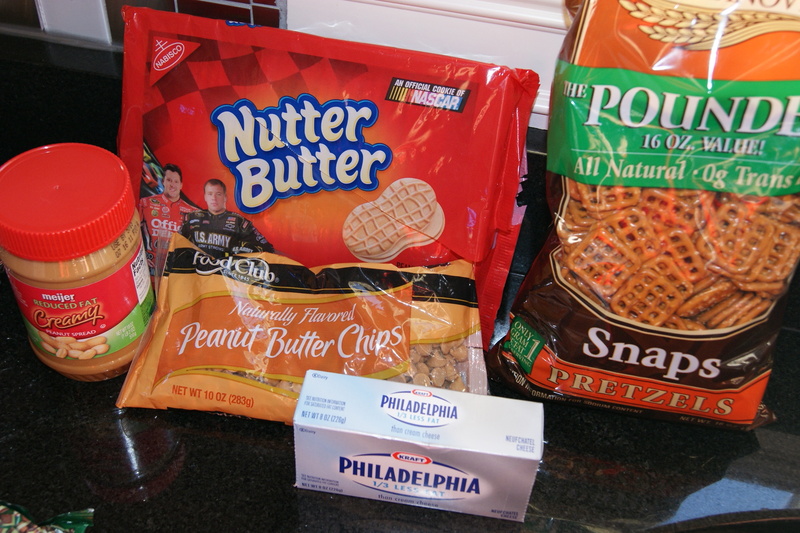 Add in cream cheese and peanut butter and stir until thoroughly mixed. On cookie sheet, line up pretzel in rows. 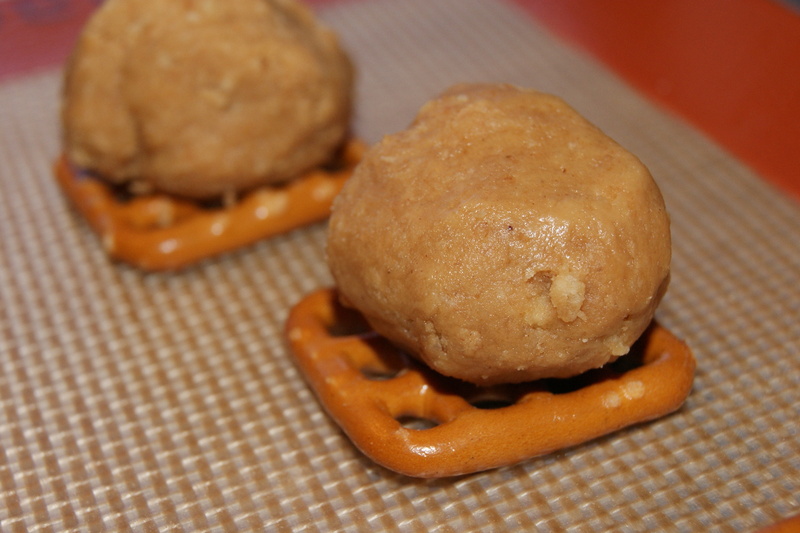 Form peanut butter mixture into 1 inch balls and place one on top of each waffle pretzel until all of the mixture is used up. Top with another waffle pretzel and gently push down to secure pretzel in its place. In small baggie melt 1 c. of the peanut butter baking chips in microwave. 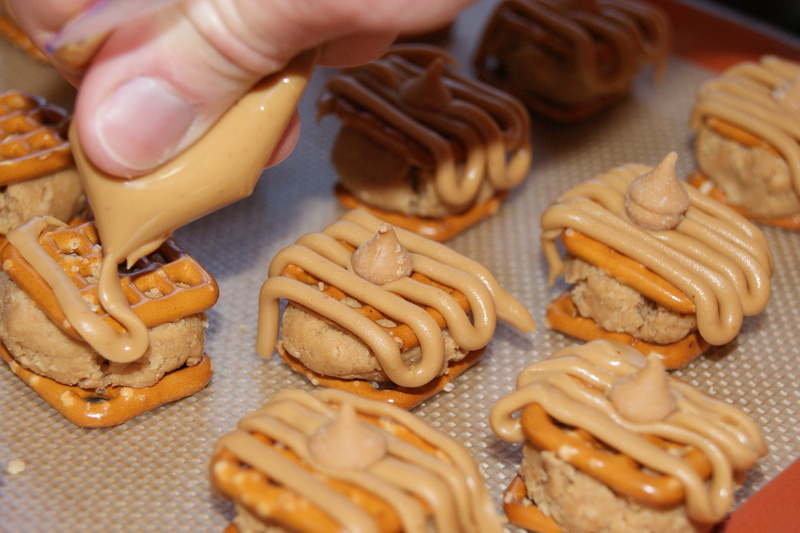 Snip off a small corner of the baggie and squeeze to drizzle the peanut butter on top of each pretzel treat. 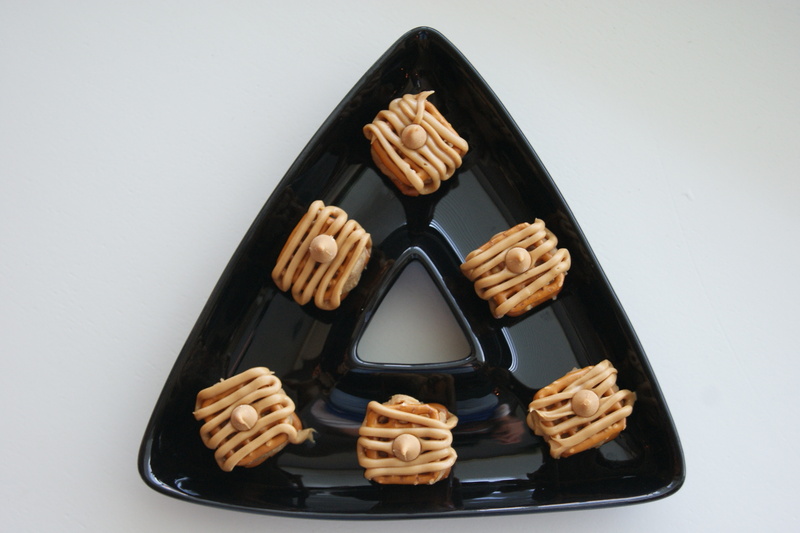 Before it hardens, place another peanut butter chip on top for decoration. Allow to harden. 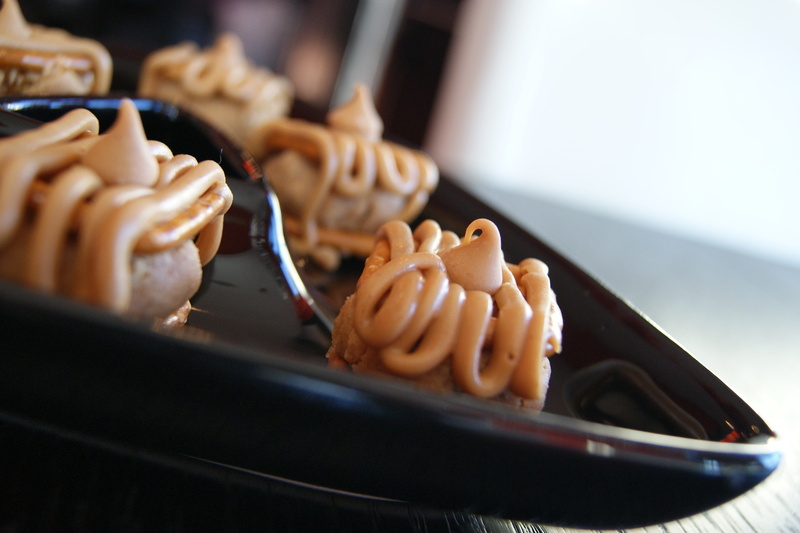 Then grab with your fingers and pop in your mouth for some pure peanut butter enjoyment! Peanut butter is one of America’s favorite foods. 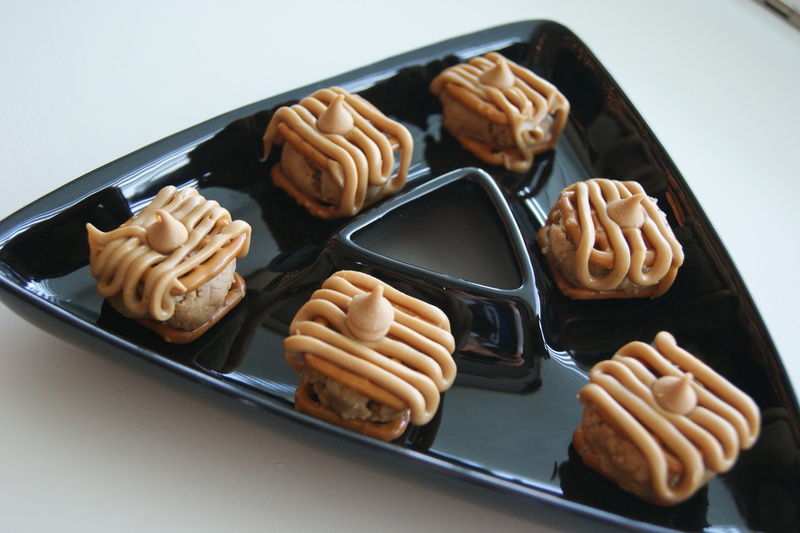 These simple, easy to make peanut butter treats will be gone before you know it! My recipe is a variation of this one found on Picky Palate, a site I love! Now I am preparing for a holiday cookie exchange party tonight. I’ve got to take 5 dozen treats! That equals ALOT of time in the kitchen this afternoon. So I should come home with several dozen treats from others. Hoping I get some good ideas! 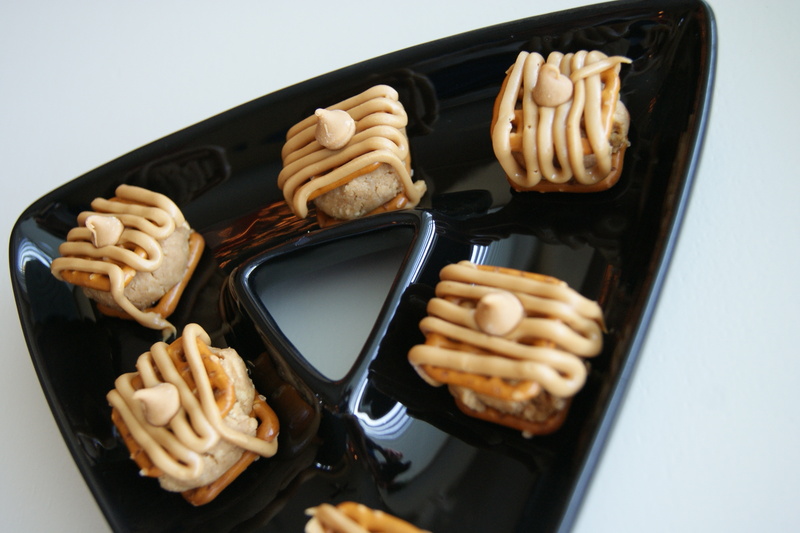 This entry was posted in Deliciousness and tagged bite, Cream cheese, nutter butter, Peanut butter, Pretzel. Bookmark the permalink. I just found you via twitter and am so glad I did 🙂 These look delicious!! now those look way to good, I think they would disappear as fast as I could make them! Thank you Dennis~They’ll disappear as they are bite size and so easy to pop in your mouth! These are adorable. 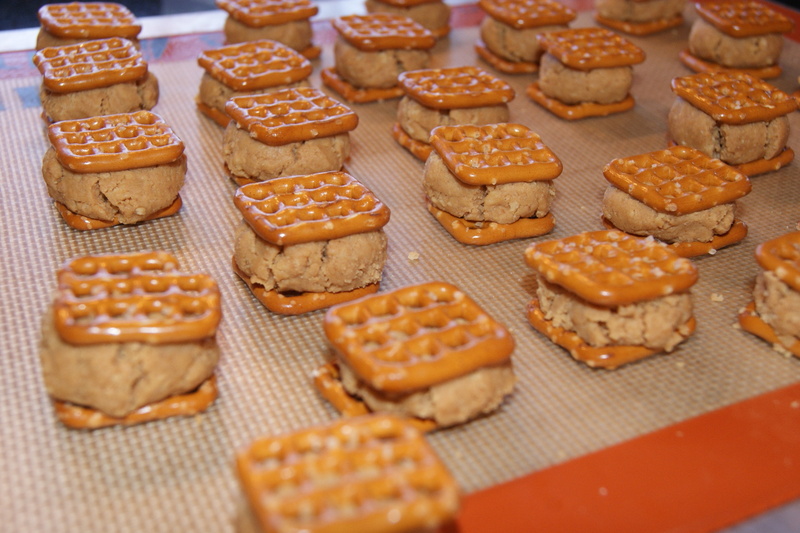 I love the waffle pretzels…..adds a little salty to the sweet mix. Had you not “friend request” me on Foodbuzz, I would not be able to find your amazing blog. Your holiday treats are so beautiful, and professional looking…not to mention how yummy they are!…you are very talented and have a lot of patience making these treat. Love the salsa idea as a gift, too! Ah, thank you so much Elisabeth! And I’m in the kitchen now making 5 dozen creme de menthe oreo poppers for a cookie exchange tonight! What a fun treat! I can see the peanut butter loving friends in my life loving this! What a neat idea and the picture is great! I look forward to reading your posts. How fun are those?!?!? You keep posting the most adorable snacks/desserts! So great! Awe, well thank you! They are easy to make too! Gotta love easy fun finger food! Oh man, I love peanut butter so much these are calling my name. I love the use of the pretzels in here. Thanks for the friend request! You are welcome Debbie. 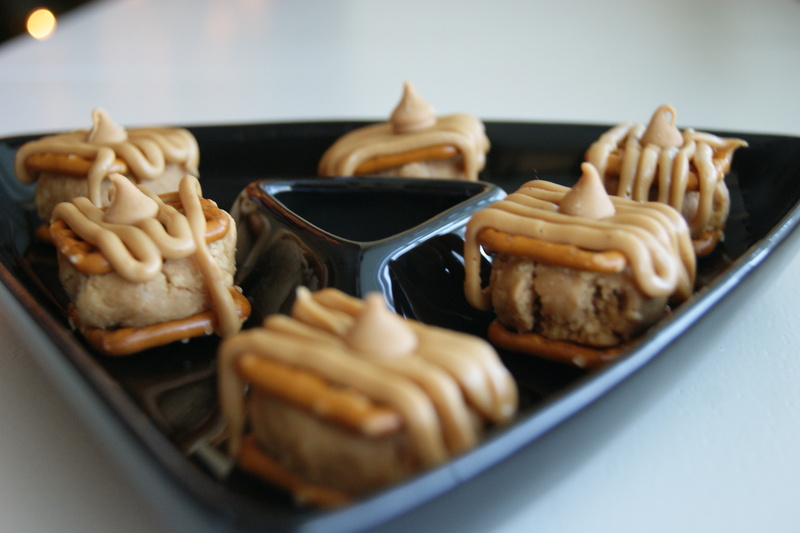 Enjoy the PB treats! If ifnroamiton were soccer, this would be a goooooal! These sounds absolutely amazing. Peanut butter is one of those things I always say yes to. Can’t go wrong with PB! These are so cute! Who doesn’t love peanut butter! These would get eaten up quickly in my house. I made all these and gave them away, but I did keep a few for myself. Only a few, otherwise I would have eaten them all probably! Ha! They are easy to make Yin! wow – these look rich and tasty – what would you serve to drink with this – maybe a peanut butter egg nog? Oh my gosh, these look incredible! And they look way to easy to keep popping in my mouth. What a fun treat! Thanks for visiting my site. 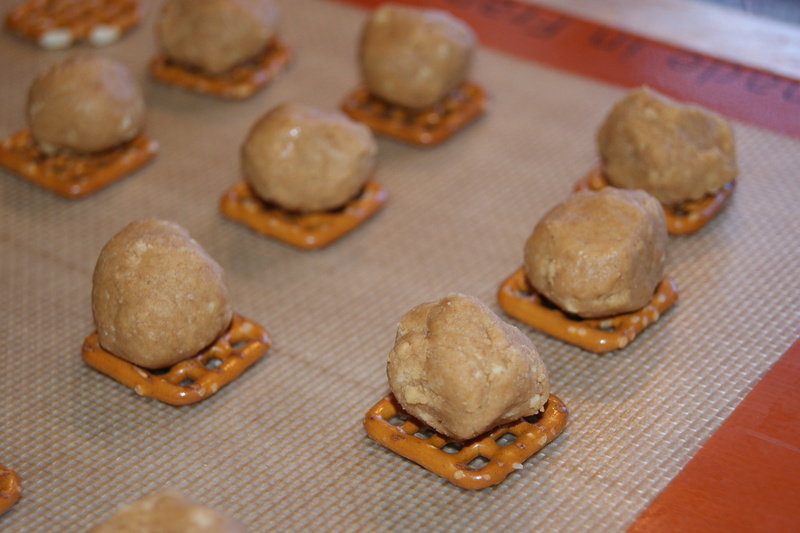 that looks amazing – anything with pretzels and sweets…mmmm…. A great sweet and salty combo! Yum! Can’t wait to make this week! I think I’d keep them all for myself though haha. Yes Meri, they are that good!